The Salinas Valley is in Northern California. I think the difference between a lie and a story is that a story utilizes the trappings and appearance of truth for the interest of the listener as well as of the the teller. A story has in it neither gain nor loss. But a lie is a device for profit or escape. I suppose if that distinction is strictly held to, then a writer of stories is a liar—if he is financially fortunate. Steinbeck has his main character drop the word at the end of the novel. Earlier it had been explained that the Hebrew word from the Bible meant that humankind may or may not triumph over evil, that we're allowed—we're given the free will, if you will—to do good. But what a cop-out, after all those pages of some characters struggling within themselves to become good, to overcome their inner demons, while others seem to act that way or the opposite quite naturally. Especially after such a brilliant job of showing all the factors of fate, human nature, and social pressures that form us. 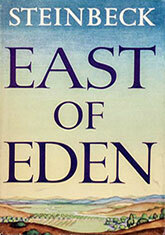 If anything, East of Eden shows how difficult it is for us to be anything other than what we are shaped to be. Steinbeck is marvellous at working out the subtle psychological effects brought to bear, to begin with, on the young Charles and Adam Trask as they seek to make their way in the shadow of a prominent, militaristic father in the post-Civil War period in the United States. No easy explanations are allowed. We are drawn into the family conflicts without fuss or muss, coming to accept the status quo. Then we are surprised at the sudden turns in other directions, people moving out of their ruts, though upon reflection they are completely realistic—we should have seen them coming, we feel. That's the best kind of writing: creating and exceeding expectations. This carries forward into the next generation and by the time we get to Cal and Aron, growing up under the shadow of a damaged, withdrawn father, we are open to anything. And we get it, without it seeming arbitrary. Wild hopes and efforts, repeatedly dashed by reality, by each other. So why timshel? To offer hope after all that? Perhaps this is why the latter pages of this mammoth and well-planned novel appear somewhat rushed. As though Steinbeck was too eager to wrap it up into a package, dispose of all the main characters quickly and draw his moral about life. Perhaps too this is why so many of Steinbeck's characters, usually self-taught folk like the dreamer Samuel Hamilton and the Chinese servant Lee who really runs the Trask family, are revealed as deep-thinking wise men. Even the not-so-wise are prone to being overcome at any given moment by profound insights into life. Not to mention Steinbeck's overview delivered in the authorial voice when no characters are available as mouthpieces. And perhaps this is also why, despite all the crushing blows delivered by the world and rained upon people by each other, there's a sentimental streak a mile wide through East of Eden, as in almost all of Steinbeck's writing up to this point. He must feel we need it. And it does feel good. We do embrace that liqueur and drink it in, warming inside to the characters and to the world they explicate. But this is still a weakness in the writing, a backing away from the hard reality otherwise being revealed. It lessens the impact that could otherwise shake us into facing up to our problems. Steinbeck could make us learn those wise lessons of human comprehension and compassion through the exposition of plot and character, but he is not confident we would get them that way and so he spells them out. Which is not to deny that the novel as a whole is, alongside The Grapes of Wrath but in a very different way, one of the great achievements of American literature. In the end the very American story is presented to us, warts and all, to get whatever we can out of it. Which we may or may not.